We also understand UX and HTML5, helping you create stunning real-time web and mobile trading experiences to drive your digitisation strategy. With Caplin you can deliver innovative, user-centric, single-dealer platforms (SDPs) and sales automation solutions, powered by our proven e-distribution technology. 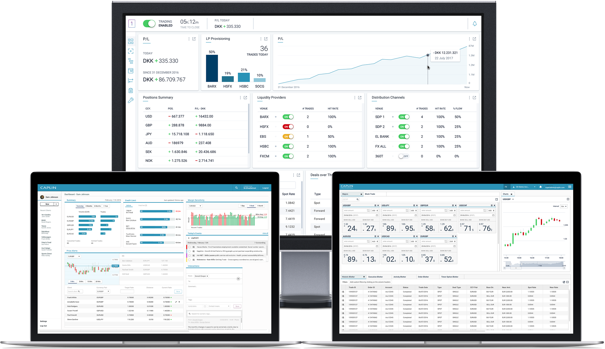 Provide your clients with an outstanding trading experience that enables them to be more productive. 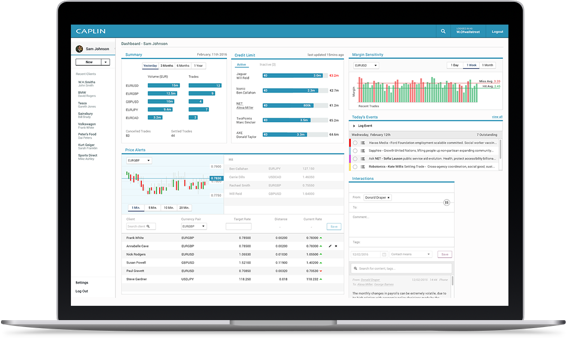 Caplin FX Professional includes full order management, advanced workflows tuned to the needs of real traders, rich pre-trade support and post-trade allocation tools. 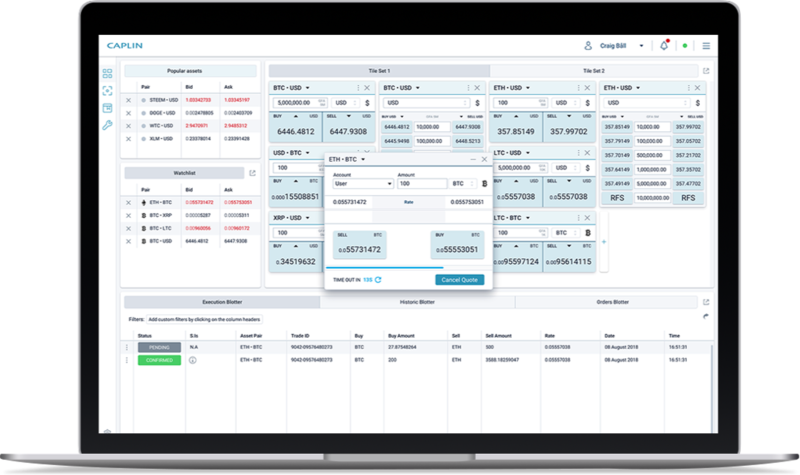 FX sales staff need to access client information instantly, to trade flexibly on their clients’ behalf, and to offer the best service to each client. 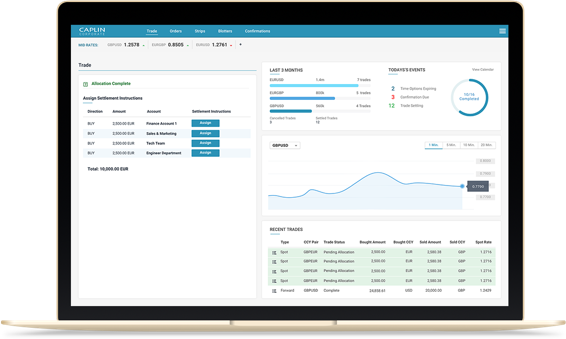 Caplin FX Sales provides a fast and streamlined solution for your sales people, whether they are initiating or responding to client calls, or intervening in digital quote requests. From small firms to large enterprises, corporate treasurers and other finance staff need to manage their FX exposure. Caplin FX Corporate gives your corporate clients an online interface focussed on real corporate treasurer workflows, and reduces your costs by encouraging the migration of routine deals from high-cost voice channels to low-cost online trading. Professional traders, corporate clients and your own staff all need to keep an eye on markets and their positions throughout the day. 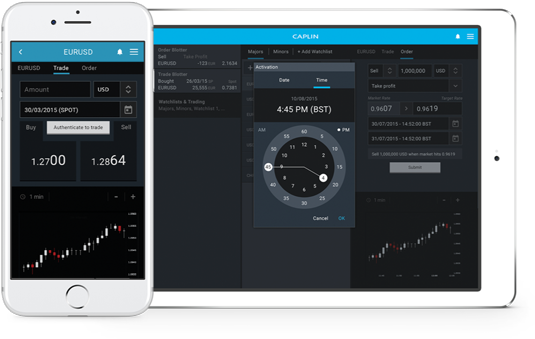 With Caplin FX Mobile, you can offer your clients real-time information and trading on phones and tablets. 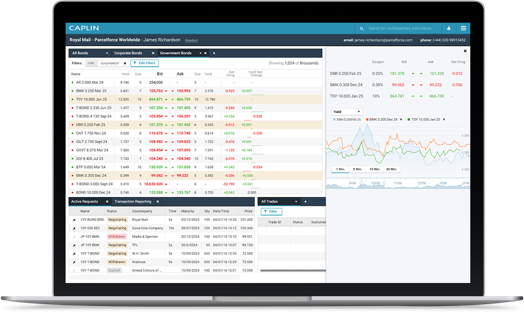 Monitor positions and proactively manage FX exposures in response to market events by seamlessly creating new orders and executing trades. Combine our award winning apps with our powerful aggregation and margining engine in a single, modular, offering. 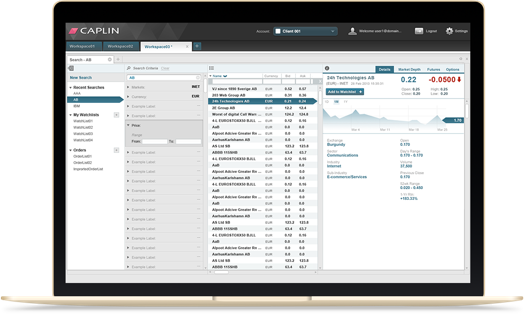 Caplin Equities provides the building blocks for a comprehensive equities trading service, including searchable current and historic blotters; a ‘market explorer’ for securities searching and watchlist creation; a market depth display; market and limit order tickets; alerts; and allocations. 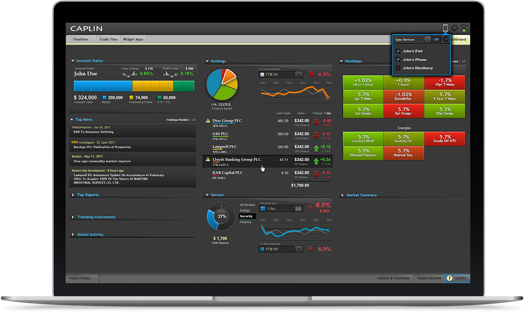 Caplin Futures is designed for exchange-based futures and options trading, and offers an outstanding functionality set: instrument discovery, quote tiles, heat maps, charts, multi-function ladders, deal blotters, position management, spreads, option chains, multi-currency account information, account flattening, alerting, and much more, all combined with Caplin’s intuitive UX design. 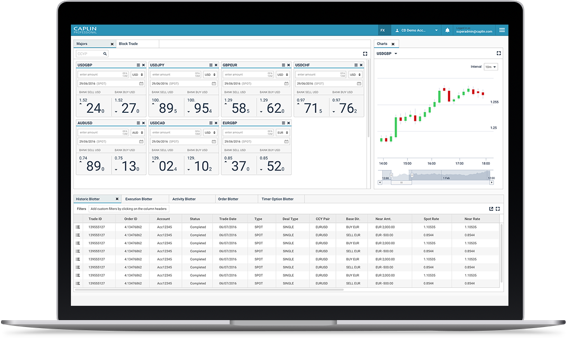 Caplin Fixed Income supports trading of rates and credit with pre-trade analysis, execution and post-trade capabilities, all within a powerful, customizable trading workflow. Users can effortlessly view inventories of unlimited size in real time, with comprehensive sorting and filtering capabilities. If you require specialised functionality not contained in any of our standard products, a hybrid solution can be created combining our different products into a single, powerful app. Alternatively, our tried and tested tools make it easy to create a bespoke solution from scratch. We offer a comprehensive design and development service to help you achieve this, either by supporting your own developers or providing a complete managed delivery. All our solutions are built on a standard set of core Caplin technologies: Caplin Trader provides the presentation layer; Caplin Platform provides the data transformation and distribution layer; and Caplin Integration Suite provides the integration layer. Real-time data is streaming from the Caplin Platform. Select a currency pair in the tile to see the live rate. From the outset, Caplin’s project team work with you to identify the right set of solutions to meet your business needs. We pride ourselves on building collaborative and business-value focused partnerships, and use a number of delivery strategies and comprehensive training techniques to ensure a successful launch of your new trading technologies. Caplin consultants work in both a delivery and an advisory capacity, acting as thought leaders to ensure that our customers have the tools and knowledge to adapt and grow. With our extensive experience of working successfully with third-party vendors and customer development teams, Caplin can deliver maximum impact within the shortest possible time. Caplin have experienced engineering staff familiar with trading software and associated technologies. Caplin teams can be embedded onsite or work remotely to assist with a range of tasks: from full system builds to light integration work. Whatever you choose, the focus is on immediately impacting projects and upskilling your development team. Caplin operate a 24/7 helpdesk ensuring that we’re available when you need us. We work with your support teams to ensure a seamless experience for your clients and users alike. Our dedicated Account Managers give you a channel to request new features as part of our regular road map releases, ensuring we remain aligned with your business objectives. Since the beginning, we have been dedicated to providing an outstanding Developer Experience to our clients' teams. Our core engineering team are passionate about delivering an HTML5 framework that supports a rapid build, test, and release cycle; libraries that are simple to use and well documented; and integration APIs that allow you to rapidly integrate your systems with the Caplin Platform. We see our eFX offering as strategically important to the growth of our business. Our new platform will mark us out as a market leader in the rapidly growing online trading market, and we decided Caplin was perfect for this project. That this solution will work just as well on mobile platforms, and so future-proofs the business, was also a deciding factor for us. At Nordea we create superior value for our customers, and long-term customer relationships. One aspect of this is a state of the art SDP with a reliable real-time delivery infrastructure. Caplin’s technology has provided us with a complete connectivity and subscription management system. Caplin's white papers and case studies are widely read within the e-commerce and financial trading industry. We regularly publish new content about electronic trading, single-dealer platforms (SDPs), rich Internet application technology, web trading technology and HTML5, so it's worth checking back from time to time. UniCredit chose the Caplin Platform and Caplin Trader to build its UC Trader single-dealer platform. Standard Bank's Corporate and Investment Banking unit used both Caplin Trader and Caplin Platform to create its own single dealer platform. 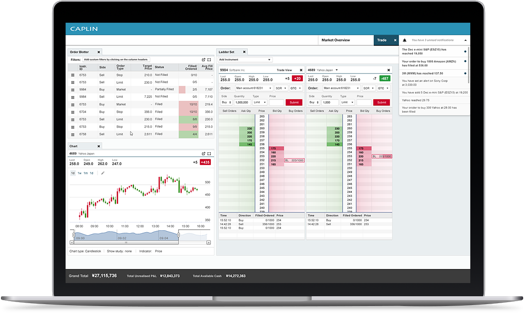 The financial firm chose Caplin's web trading technology and worked closely with us to create a unique and compelling FI trading application.